Registration is Now Open for our 22nd Annual Barnegat Bay Environmental Educators Roundtable! The Ocean County Soil Conservation District will hold our 22nd Annual Barnegat Bay Environmental Educators Roundtable on Wednesday, April 17, 2019, at the Lighthouse Center for Natural Resource Education, Waretown, NJ. Registration for this exciting event is now open. Choose from an array of workshops aligned with this year’s theme: “Changing Climate, Changing Watershed”. Learn about the effects of our changing climate on the vital and unique natural resources in the Barnegat Bay watershed. Our Keynote speaker, Lisa Auermuller, Assistant Manager of the Jacques Cousteau National Estuarine Research Reserve, will share the latest resiliency tools against anticipated storm events. Enjoy networking with other educators and exhibitors representing over a dozen environmental organizations in the Barnegat Bay watershed. Light dinner and dessert will be served. Cost: $25 per person. REGISTER EARLY to secure a spot in your favorite workshops! Take a look at the variety of workshops you can choose from! A. Field Trip to Cedar Bonnet Island Led by Dr. John Wnek and students from MATES Academy. Join MATES “Project Terrapin” crew on a trip to Edwin B. Forsythe National Wildlife Refuge at Cedar Bonnet Island. MATES Center for Research and Applied Barnegat Bay Studies (CRABBS) is monitoring changes in soils and vegetative coverage on the island to determine the effects of climate change, sea level rise and other factors that may have a resulting impact on nesting Diamondback Terrapins. Methods used for collecting data are inexpensive and can be easily incorporated into your curriculum. Dr. Wnek and his students will provide a hands-on experience along with lessons that you can take back to your classroom. MATES students will share some of their research and preliminary theses. **A pre-arranged van will transport you from the Lighthouse Center to Cedar Bonnet Island and back again. Seating is limited, register early. Please dress appropriately for outdoor learning. 1B. System-Wide Monitoring Program (SWMP): Real-time Monitoring Data at Your Fingertips presented by Kaitlin Gannon, Education Coordinator, Jacques Cousteau National Estuarine Research Reserve. The NERRS System-Wide Monitoring Program (SWMP) collects environmental monitoring data such as water, weather and nutrients on coastal habitats. This data can be accessed by anyone, used by local decision makers, aquaculture farmers, and researchers. SWMP can also be a great educational tool to enhance data literacy. This presentation includes a SWMP introduction, how to access SWMP, and lessons that incorporate the data. 1C. Piping Plover, an Endangered Beach Nesting Bird in New Jersey: What Does its Future Hold in an Age of Climate Change? presented by Todd Pover, Senior Wildlife Biologist, Conserve Wildlife Foundation of New Jersey. The piping plover, a state endangered shorebird that nests on New Jersey’s beaches, is at-risk from a number of threats, including predators, human disturbance, habitat loss, and flooding. As climate change and sea level rise accelerate, what impacts will that have on this tiny shorebird that already faces a precarious existence living on an ever-changing beach habitat. Todd Pover, who has studied and protected piping plovers and other beach nesting birds for 25 years, will provide a glimpse into their fascinating behavior and biology, as well as what is being done to protect them. He will discuss how climate change may impact their recovery, a surprising complicated scenario linked to their unique habitat needs. 1D. Paddle for the Edge: Citizen Scientists Monitoring Our Changing Shorelines presented by Martha Maxwell Doyle, Project Coordinator, and Emily Pirl, Field Technician, Barnegat Bay Partnership. “Paddle for the Edge” is an annual citizen science data collection event. Volunteer paddlers are trained to use a smart phone app to collect data about the condition of Barnegat Bay shorelines. The data is useful to planners and resource managers in many ways – providing information about flooding and storm impacts, predicting how shorelines may react to sea-level rise, and identifying potential restoration areas. In this session, educators will learn about the types of data collected and how scientists and students can use it. 2E. Connecting Students with Climate Change presented by Mindy Voss and Rosemary Higgins of NJ Sea Grant Consortium. Educators will learn strategic framing techniques to effectively communicate climate change, especially to children. In this session, educators will learn best practices on how to introduce climate change in a classroom setting, teach impacts with inquiry based hands-on activities, and create student driven solutions to encourage positive action while encouraging appreciation for the environment. The activities include lesson plans for each participant that satisfies Next Generation Science Standards. 2F. Biodiversity, Living Shorelines and Water Quality presented by Chris West of ReClam the Bay. The effects of climate change are evident in our watershed, including in the Barnegat Bay. Biodiversity and living shorelines can offer resilience, resistence and stability. Shellfish play an important role in these defenses, and also ensure high water quality. Through interactive, hands-on lessons we will demonstrate how to teach these concepts to your students and provide them with the tools and inspiration they need to become stewards of our changing watershed. 2G. The Water Cycle and Climate Change presented by Dr. Steve Yergeau, Rutgers Cooperative Extension of Ocean County. Watersheds undergo changes due to development, landscape management and increased impervious cover that all impact the water cycle. Less water infiltrates into the soil, more frequent floods happen and more polluted stormwater enters our rivers and lakes. Climate change will bring increased precipitation and stormwater, causing these problems to only get worse. Hands-on activities will be modeled for use with students to introduce them to watersheds, the water cycle and the impacts due to climate change. We will also discuss the possible solutions that people can do on a daily basis to mitigate effects of our changing climate. REGISTER NOW, to ensure a spot in your favorite workshops! 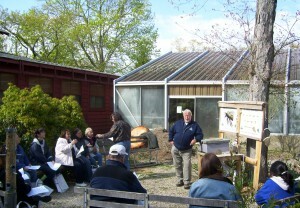 Terry O’Leary and McDuffy Barrow, of the Forest Resource Education Center, teach a group of educators about bees at the 2010 Environmental Educators Roundtable. The Ocean County Soil Conservation District has been effectively and successfully coordinating the Barnegat Bay Environmental Educators Roundtable since 1997. A primary task of the Steering Committee who represent nearly twenty area groups and agencies, is to assist local educators in the inclusion of Barnegat Bay watershed-specific information and materials into their lessons, activities and programs. The Barnegat Bay Environmental Educators Roundtable provides a mechanism for environmental educators to share resources and information related to the watershed. The enthusiasm instilled in educators is carried back to their schools, nature centers, science institutions and colleagues, and helps to promote environmental education opportunities within the watershed. It is the perfect venue for professional development opportunities for both school teachers and informal educators. The program and itinerary for the Roundtable varies each year, with additional partners and customized programs adding to the appeal for educators to attend. The Roundtable has a proven success rate with Ocean County educators. The educational programs and opportunities available from all participating agencies, organizations and groups allows a comprehensive approach to watershed education and provides educators with a “one-stop-shopping” approach. It is well known that educators are more likely to present and teach topics with which they are familiar and comfortable. The main goal and objective of the annual Barnegat Bay Environmental Educators Roundtable is to provide this opportunity and to ultimately improve and protect the health of the Barnegat Bay watershed. For more information, please contact Becky Laboy, Education Outreach Specialist, education@soildistrict.org or 609-971-7002 ext. 114. The Ocean County Soil Conservation District held our 21st Annual Barnegat Bay Watershed Environmental Educators Roundtable on Wednesday, April 18, 2018, at the Lighthouse Center for Natural Resource Education, Waretown, NJ. The goal of the Roundtable is to provide educators with ideas and lesson plans that offer meaningful ways for instilling a sense of place in their students and build upon existing curricula by making it locally relevant. This year’s workshops were centered around the theme: “Back to Our Roots”. Presenters shared lessons that reflected the importance of the cultural, historical and natural resources that make the Barnegat Bay watershed a unique and ecologically important place. Workshops included: “A Field Trip to Cloverdale Farms”, led by Patti Trasferini of Ocean County Parks & Recreation, “Aquatic Invasive Species” by Karen Byrne of Sedge Island Natural Resource Education Center, “Native Carnivorous Plants” presented by Terry O’Leary, “Ospreys” presented by Ben Wurst of Conserve Wildlife Foundation of New Jersey, “The Effects of Climate Change on Barnegat Bay’s Natural Resources”, presented by Rosemary Higgins and Mindy Voss of NJ Sea Grant Consortium, “Enviroscape: Teaching about Pollution Prevention” presented by GraceAnne Taylor of Save Barnegat Bay, and “Building Ecological Solutions for Coastal Community Hazards” presented by Allison Mulch of NJ Audubon and Jim House of Egg Harbor Twp. High School. Our Keynote Speaker, award-winning educator and local film producer, Angela Andersen, showcased her new documentary “The Oyster Farmers”. The film highlights the renaissance of the aquaculture industry in the Barnegat Bay watershed. From the raw bar to the reef, it is just a drop in the bucket for the community to lend a hand in restoring the bay. The Ocean County Soil Conservation District celebrated our 20th Annual Barnegat Bay Watershed Environmental Educators Roundtable on Wednesday, April 19, 2017 at the Lighthouse Center for Natural Resource Education, Waretown, NJ. Doors opened at 3:00pm for networking, resource sharing and a delicious light dinner. Workshops began at 4:30pm. Our Keynote Speaker, Dr. John Wnek and his MATES students enlightened participants about the great they are doing to enhance Diamondback Terrapin habitat and remove derelict ghost crab traps from the Barnegat Bay, in an effort to reduce unnecessary terrapin fatalities. Our 2017 workshops showcased lessons and activities from “Discovering Barnegat Bay!” – the OCSCD educator’s curriculum. All participating educators received a free curriculum guide containing 40 lessons based on soil, water, natural wonders, people and places, history and geography of the Barnegat Bay watershed. The 2016, 19th Annual Environmental Educators Roundtable supported the theme “We All Need Trees”, a topic promoted by the NACD (National Association of Conservation Districts) for the 2016 nationwide Poster Contest. Workshops emphasized the importance of trees in the Barnegat Bay watershed and in our lives. Presenting organizations included the Forest Resource Education Center: “Tree ID Walk & Talk” and “Sounds From the Forest”, New Jersey State Forest Service: “Silviculture and Sustainable Forest Management”, NJ Sea Grant Consortium: “Weather, Climate, Trees and the Importance of Understanding Storm Surge”, New Jersey Pinelands Commission: “The NJ Pinelands – More Than Pine Trees”, Ocean County Parks & Recreation: “What Trees Lived Here Before My school Was Built?”, Kateri Environmental Center: “Tree Mysteries”, and Cedar Hollow Consulting, Naturally! : “EcoTour – Streaming the Rivers and Creeks of the Barnegat Bay Watershed”. Keynote Speaker, Karen Walzer of Barnegat Bay Partnership, introduced participants to Jersey-Friendly Yards, a new website designed for the home or school gardener, offering step-by-step support to create an environmentally friendly garden or landscape using native trees, shrubs and perennials. The 18th Annual Environmental Educators Roundtable celebrated the “International Year of Soils” by offering a variety of engaging workshops that allowed participants to dig a little deeper into the workings of soil. Keynote Speaker, Rob Tunstead of NRCS, shared his research that centers on mapping the soils on the bottom of the Barnegat Bay. Presenting organizations included Ocean County Parks & Recreation: “Guided Tour of the SHIP Gardens at Jakes Branch County Park” and “Shifting Sands”, Kateri Environmental Center: “What’s a Wetland?”, Cedar Hollow Consulting, Naturally! : “Touring the Pygmy Pine Forest”, NJ Sea Grant Consortium: “Sedimental About Beaches”, and NRCS: “Get to Know Your Soil”. 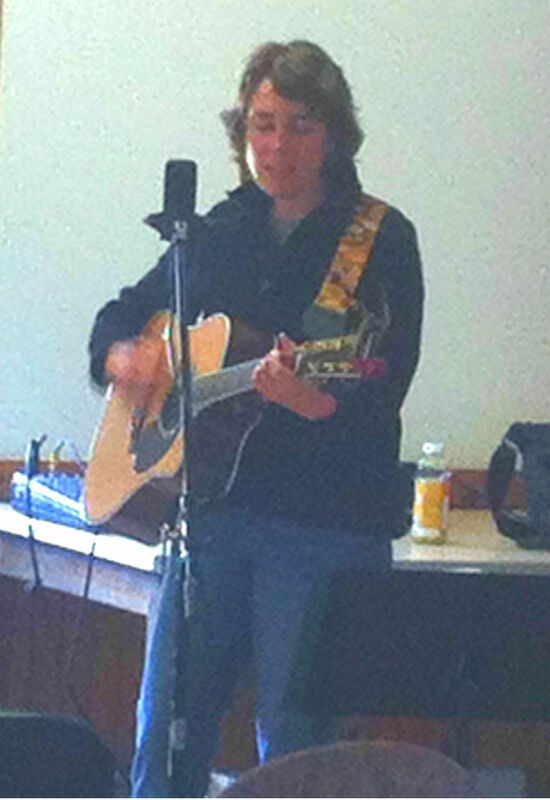 Heide Winzinger, an NJ born folk singer, performs at the Roundtable. The 2013, 16th Annual Environmental Educators Roundtable was hosted on April 24, 2013 by the Ocean County Soil Conservation District. As with previous years, the 2013 Roundtable included a variety of hands-on workshops where teachers gained free valuable activities and knowledge to bring back into their classrooms. In addition to the workshops, participants had access to free resources and the opportunity to take home educational door prizes. Terry O’Leary of Cedar Hollow and Bob Birdsall of Birsall Nature Photography presented a “Virtual tour of the Great Bay Blvd. Peninsula in Tuckerton, NJ“. This tour explored diverse habitats as well as the rich history of the land along this peninsula. Joanna Marino and Danielle Donkersloot of the NJ AmeriCorps Watershed Ambassador Program hosted a hands-on workshop, “Volunteer Water Monitoring Training – Collecting Real Data to Protect our Rivers and Streams“, training teachers how to become a Stream Monitor. 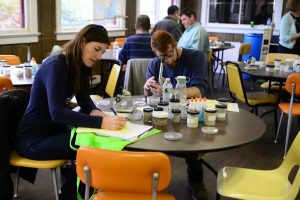 This workshop gave teachers the skills to identify living creatures in NJ’s freshwater streams, as well as determine the health of a stream by simply looking at it. Now teachers can bring their classes into the field and have their students become hands on scientists! John Wnek, from the M.A.T.E.S. Academy in Manahawkin, NJ hosted a workshop called “Lessons from a Storm: the Effects of Sandy and How to Incorporate Storm Related Lessons in the Classroom” which gave teachers new perspective on how to include topics such as Superstorm Sandy in their lessons. Please click here to download a PDF of Dr. Wnek’s presentation. Joel Mott of the NJ Pinelands Commission presented “Pinelands Overview: a Synopsis of New Jersey’s Pinelands”, a workshop to designed to give teachers the impression that they are taking a hike through the Pinelands. This presentation gave insight to some of the native vegetation, secret locations, and the history of the Pines. 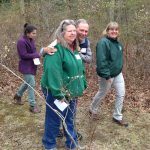 Teachers who attended this presentation gained the skills to not only teach about the Pinelands, but also to take their classes outside and use their investigative skills to identify new plants and animals. Claire Antonucci and Diana Burich of the New Jersey Sea Grant Consortium hosted a fun, hands on workshop “Understanding Sea Level Rise and How It Will Affect New Jersey’s Shorelines” which explored different techniques for teaching sea level rise in a classroom of all ages. Teachers not only learned the connection between sea level rise and climate change, but learned exciting new hands on activities to help them convey these messages to their students. Please click here for a PDF copy of their exciting presentation. Becky Laboy of Island Beach State Park hosted “Shells on the Shore of Island Beach State Park” which took a look at how shells are made, who lives in shells, and why they are on the beach.